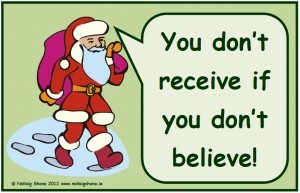 Poster to display in the classroom which may be a sober warning for those pupils on the cusp of disbelief in the magic of Santa Claus. The image of the coal may sway them! 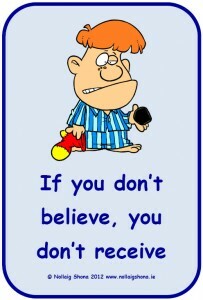 Poster to display in the classroom which may be a sober warning for those pupils on the cusp of disbelief in the magic of Santa Claus. This is a great 3D computer animated short story about a mischievous Christmas tree decoration with a hunger for some milk and cookies. It could be used simply as some seasonal entertainment in the classroom or it could be used as a stimulus for some great seasonal creative writing. This video is a simple seasonal song featuring Santa Claus teaching the numbers from one to twenty. This is a nice simple song about Santa Claus to play/teach to pupils in junior classes. This is a cute seasonal song to teach to younger pupils during the Christmas season. It’s to the tune of the popular song B-I-N-G-O is his Name. 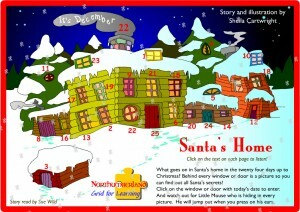 Find out what happens in Santa’s Home in the twenty-four days leading up to Christmas. Click on the text and it will be read to you. There’s also a mouse hiding in each picture for pupils to find. When you click on him, he will jump out. 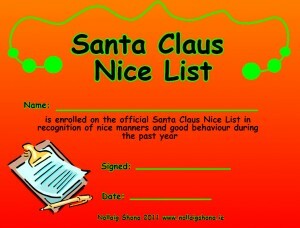 This is a certificate to present to pupils before Christmas to certify that they are on Santa Claus’ Nice List!